Like you, I believe that Emmanuel Dapidran Pacquiao will right the wrong that was inflicted in Part I of the Pacquiao-Bradley encounter. In that June 9, 2012 bout, Manny won almost every one of the 12 rounds contested; but he lost with the six eyeballs that mattered most — the judges. He’s fought for 21 years. He’s knocked-out 38 opponents including Erik Morales and Jorge Solis and Ricky Hatton. He’s a multi-billionaire who owns mansions from Forbes Park to Los Angeles. He stands only 5 ft. 6 1/2 in. short but his boxing credentials are the tallest in history: the first and only eight-division world champion. All these don’t matter today. What matters is this: MP needs a victory. A knockout. Why leave the decision to three subjective human beings? I saw this with my bare eyes last November. Just 11 rows away from the ring, my seat-mates Bunny (my dad) and Jingo (my SunStar neighbor) couldn’t believe how reluctant Manny was to “go for the kill.” Surely, the nightmare of Juan Manuel Marquez’s punch lingered in his mind. Manny was cautious. He wanted a win — by points. Manny has transformed into a good Christian in the wrong sport of boxing. Not today. At the MGM Grand Garden Arena tonight, Manny will attempt to dispel this notion. He’ll charge. He’ll weave left and right. He’ll pummel that left hook. He’ll poke the boastful Bradley. He’ll jab throwing that right punch. In the end, Pac-Man will weather the Desert Storm. Boxing is all about Proving. Proving who’s best. Proving whose egotistic words become true. Today, it’s Pacquiao who has more to prove. To us. To Bradley. To himself. To Freddie, who said, “Some people think we are all done and we have to prove that we are not.” To Mommy Dionisia and wife Jinkee, both of whom want him to retire. WEIGH-IN. Yesterday, I watched footages of the weigh-in. Everybody in the house except for Bradley’s entourage was cheering for Pacquiao. To think that our man is Pinoy fighting an American in the U.S. 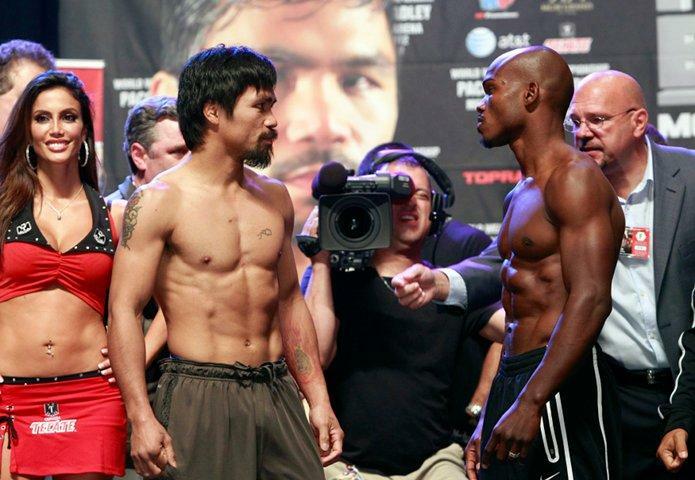 I recall the weigh-in of the Pacquiao-Rios fight last November. These weigh-ins start early, at 8 a.m. And it’s rapid-fire fast. The whole event is done in half an hour. One by one in quick succession, the boxers enter the stage, undress, step on that scale and leave. Fast. Even the main event protagonists don’t linger for long. 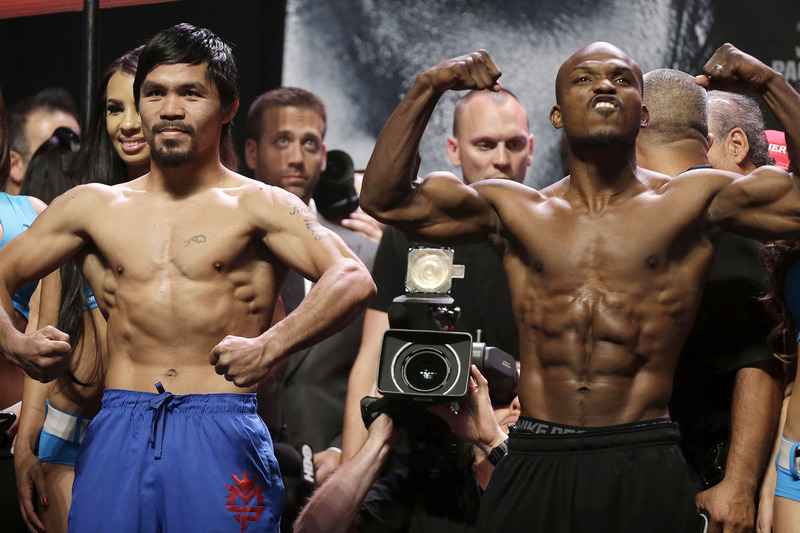 At yesterday’s weigh-in, when both Manny and Timothy stood side-by-side to flex and reveal their muscles, wow, it was like watching a body-building event. These guys are absolutely ripped! Manny was lean and brawny; Tim’s muscles were sculptured and very defined. The excitement of being there at the Weigh-In is indescribable. You’re amongst thousands of screaming Pinoys. Music reverberates. Lights flash and circle the stage. Bruce Buffer’s deep voice echoes. Bob Arum smiles. Then, the Gladiators come face to face, just inches apart, locking eyeball-to-eyeball, playing “psycho” (mental) games. KNOCKOUT? Today’s fight has the potential to be one of Manny’s greatest ever. If he wins by a spectacular knockout — against an American sporting a 32-0 record — this can rank as not only a “great comeback” but also a vindication. An I-told-you-so and never-count-me-out moment for the humble, Bible-reading Filipino. Bradley has never slept for more than 10 seconds on the Las Vegas canvas. There’s always a first time. Today.